When fans talk about the College Football Hall of Fame and Chick-fil-A Fan Experience, many use the phrase “more than a museum” because of our one-of-a-kind experiences enjoyed through immersive technology and RFID customization. But along with this incredible guest experience is a treasure trove of artifacts representing the irreplaceable traditions of the game. 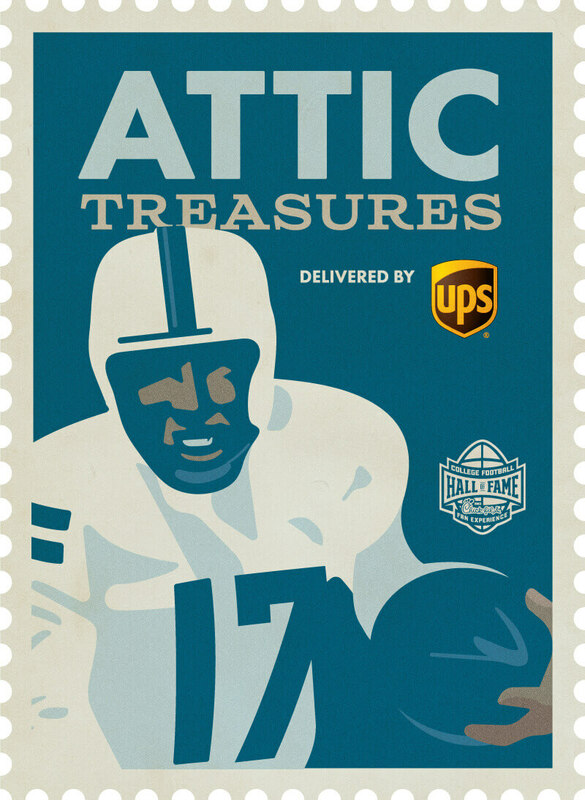 These artifacts and customs can come in unconventional forms, and our curator, Kent Stephens, has created a new exhibit displaying some of these unique and uncommon objects entitled “Attic Treasures” in the Specialty Exhibit delivered by UPS. Truly one of his most creative pieces of work yet, Kent did have a little help pulling this one together – from fans just like you! Many of the artifacts were donated by passionate alumni, former players or the schools themselves. “Attic Treasures” is not only an impressive display of random, but extremely interesting artifacts, it goes beyond to tell the story of each incredible piece. In total there are nearly 30 items in the exhibit including a sweater worn by the official timekeeper for the University of Alabama from 1935-1956; super fan gear and one of the first facemasks.